I am extremely grateful I have survived this far. Only God knows how many years I have left. I can only hope I will be given more years than what I already consumed. What I know for sure is I have to value my time left here on this beautiful Earth. That means I must improve every aspect of my life. Well, first stop is health. Why? Because I intend to enjoy the remaining half of my life in tip-top shape. I know the sad effects of ageing will catch up with everyone, the body will eventually deteriorate and wither. But I have to try not to let it catch up with me too soon. Three days before my birthday I started getting into the habit of juicing. Everyday I wake up earlier (5:30 on work days) to prepare juice for the family. The juice is the first thing we drink, before breakfast. Because it is taken with empty stomach nutrients from the juice are more efficiently absorbed. Why Juice? 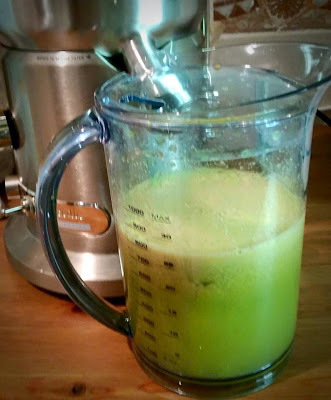 According to Joe Cross of http://www.rebootwithjoe.com/, "Juicing offers many life-enhancing health benefits including a faster, more efficient way to absorb immune boosting nutrients naturally found in fruits and vegetables. It provides a way to access digestive enzymes typically locked away in the fiber matrix of whole fruits and vegetables." Our monster juicer is Breville 800JE. I love it because it is so easy to use, disassemble and clean. The feed chute is big enough that I don't have to cut the fruits and veggies into small pieces. 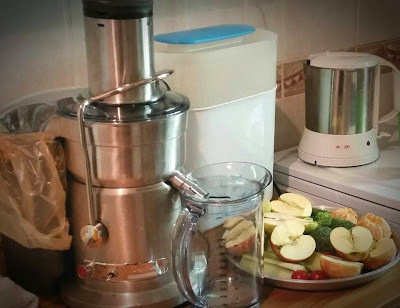 It effortlessly extracts the juice of every fruit and veggie, and believe me, it's fast! With its sleek stainless steel exterior, it looks good in our kitchen too. I highly recommend it. This is the resulting juice of broccoli, celery, ginger, oranges, apples, cherry tomatoes and cucumber. So far so good. I have not missed a day and I plan to do it everyday for the rest of my life. It is too early yet to write testimonials but I am convinced I will reap tremendous health benefits because of this in the future.